Financial Regulation Matters: Interserve on the Ropes, or a Model on the Ropes? Back in August 2017 we looked at the concept of the ‘private finance initiative’, and also the differences between ‘public private partnerships’ and ‘private finance initiatives’, which has also been dissected in the literature. We looked at the issue of Carillion and the aspects that underpinned its high-profile collapse. However, for this post, the question will be whether the recent developments at Interserve, the massive provider of public services in the UK, is part of a general trend or an indication of a fundamental flaw within the model that is being adopted currently. 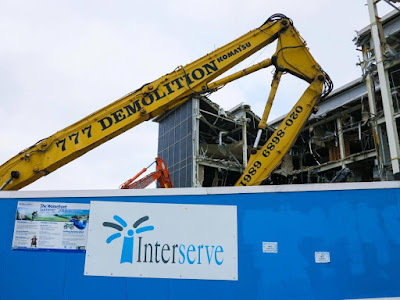 Interserve began as London and Tilbury Lighterage Company Limited in the late 1800s, and through a number of phases of expansion over the century and more that followed, the company was renamed Interserve Plc in 2001. The company has a global reach, but for this post our focus will be on its role within the UK, where its function is particularly vital. According to Interserve itself, it has reported revenues of £3.7 billion and, when the website was constructed, the sentiment of the narrative was progressive and expansionary. However, it was announced recently that the company was in rescue talks with creditors for the second time in nine months, as it also being reported that the company is in debt to the tune of more than £500 million. The effect of this news on a company so large is inevitable, with news that the company’s shares are operating at around 12p, which is a dramatic fall from the 2014, when shares were valued at over 700p a share, and even a year ago when they stood at 100p a share. The Financial Times opines that even though the deal to refinance sees shareholders face ‘material dilutions’ of a number of their shares, banks do not think that Interserve is to become ‘Carillion Mark Two’, on account of a variety of influencing aspects, with the primary reason being a different environment and attitude towards rescuing such societally-interwoven companies. The British Government perhaps personifies this approach – essentially a too-interwoven-too-fail approach – with news that it will continue to award contracts to the company, despite its financial difficulties. It has been noted in the media that the Government are playing a dangerous game in that they are currently facing criticism for awarding £1.3 billion’s worth of contracts to Carillion when it knew the company was in distress, but perhaps there is a reason for the Government adopted such a risky strategy. One reason why they may have done this is because, for the Government, it is not a ‘risk’ at all. Perhaps, for this Government in particular, it is an ideological necessity that Interserve is supported, and that Carillion was supported even in the face of negative financial declarations. In the literature it has been identified that such partnerships between Government and Business are essentially a ‘brand for how governments want their interaction with business and society viewed, or, alternatively, how they want the role of government in the economy viewed’, which clearly hints at an ideological approach. The development of this form of societal investment is, seemingly closely tied to the development of globalisation, with this approach being witnessed around the world and with companies spreading their reach to meet that demand (Interserve is a good example of this). Yet, we have spoken here in Financial Regulation Matters many times about viewing global developments in a cyclical manner, so with that being said what may be the message from this uptake of public and private partnerships? The first thing to note is that the symbiotic relationship that exists between certain political outlooks and big business creates results, but that it is difficult to see how they are long-term in nature. The appalling lack of oversight on instances such as Carillion show us that the maintaining such a relationship, for the benefit of the public, is not really a concern – the real concern is developing tangible and public examples of development in order to provide support for the model; for example, pictures in the media of half-built hospitals do no good whatsoever to the development of the partnership, which as we know is underpinned by public money. The second thing to note is that this narrative of needing big business to flourish has become so entrenched, it is difficult to foresee any other model taking hold. It is not suggested here that another model should be adopted, nor that it would be any better necessarily, but it is clear that this current model of cartelisation on the back of public funds does not work, and is societally damaging – so, what does this mean? One thing that it may mean, thinking of the UK in particular, is that suggestions that a number of key infrastructure areas will be nationalised once Labour get into power, if they do, is easier said than done. Nationalisation has taken place before, but this current era is dominated by the entrenchment of a narrative (aided by the development of the internet and social media etc. ), which means change would have to be incremental if it were to be successful. It also means that the Conservative Party, for however long they remain in power, must continue to support companies like Interserve, because it is their ideological position that is on the line. The relationship between big business and government must work if the Conservative Party is to remain in power and relevant, and as such it is anticipated that only an absolute and sudden collapse would see Interserve vanish. The concept of ‘too big to fail’ is commonplace, but the connection of certain fields to politics must not be ignored. In a sense, Interserve is too politically important to fail, as it represents an ideology that has taken years to construct and implement. Yet, we are in an era where continuing corporate failures are being contextualised by societal instability, so the question may be how long will the public sit by and allow their money to be utilised as a fundamental safety net, especially when they do not directly see the financial benefit of doing so?